NEW PRICE!SELLER SAYS SELL! Welcome to the best of coastal living in this bright, well-kept two-story home. This beauty has been expertly remodeled from top to bottom. From the main level, the wrap-around open staircase leads you up to a magnificent second-floor great room featuring wall-to-wall windows, vaulted ceilings, home office built-ins, a wet bar, and an gas fireplace. 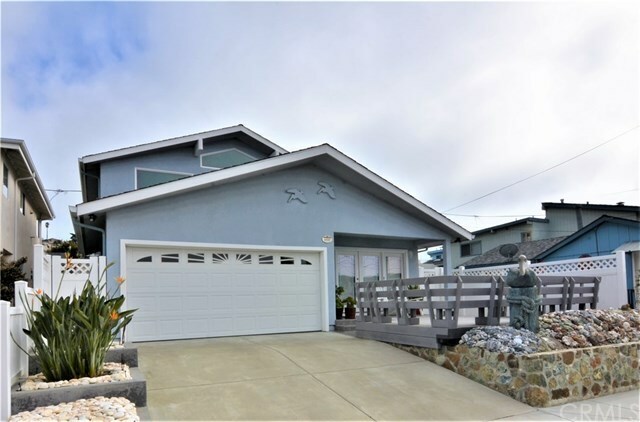 Fabulous west-facing views of the Pacific and Morro Rock give panoramic access to the ever-changing sunsets, whether staying cozy inside or stepping outside onto the protected, private deck/patio. An open, eat-in kitchen and pantry closet expand out to combined dining and second living room with French doors leading to the lower porch and entertainment deck. Down the hall, two main-level bedrooms are customized with large closets, one with built-in shelving. Upscale bathroom featuring an expansive walk-in shower and double vanity. Upgrades are found throughout this move-in ready home, including hardwood floors, granite counters, sculpted ceilings, recessed lighting, built-in sound system, custom window coverings, and modern ceiling fans. And attractive, all-weather fencing surrounds the home's finished outdoor living spaces with low-maintenance landscaping. Epoxy coated floors cover the extra wide single garage space, complete with convenient lower-level laundry hookups and storage areas. With shops, restaurants, community parks, and beach access all just a few blocks away, this is a coastal gem. Directions: Hwy 1 to Main Street/Hwy 41 Exit. East to Main Street. Left turn headed north onto Main, right at Avalon. Left to Greenwood. Selling Office: Ciano Real Estate Inc.